People on Vacation – possibly so named for the fact their members are on a ‘vacation’ from better-known groups – are an intriguing duo. 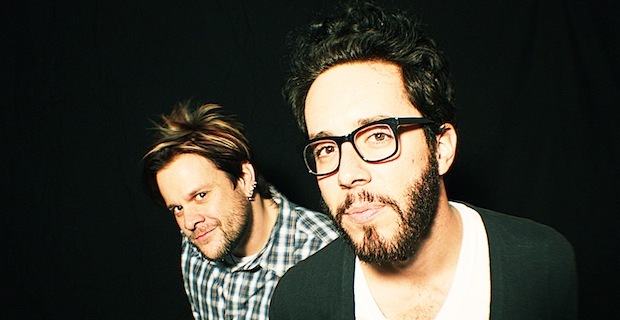 Jarret Reddick from Bowling for Soup and Ryan Hamilton from Smile Smile have collaborated to produce six songs of remarkably stripped down, mellow fare that contrasts starkly with their prior efforts in the world of rock. Their main focus, according to the notes on their site, is to ‘tell stories’ and create quality songs focusing on something other than the eternal relationship woes which inform so many other artists’ work. In this endeavour, they have been marginally successful. The tracks are generally quite good – ambient, indulgent, and enjoyable, though their frivolous efforts stop short of convincing. One can’t but get the feeling that, for a side project formed to tell stories, they don’t actually say very much. The EP is smooth and well-executed however, offering a slightly more mature and restrained take on the irreverent good fun that Reddick in particular is used to. It does tend to sound like the soundtrack to a self-important indie movie, but that goes with the territory, and one can’t fault the attentive detail in the songs. “Better Off Dead” gives one pause, its soft folds of music removed and uninspiring at first. It gains more focus with the addition of further instruments, taking on something of a vintage feel in the juxtaposition of easygoing, melodic vocals with the chirpier music. It isn’t that impressive – the music remains persistently bland throughout and there’s not enough power or purpose for it to really vie for your attention, but it has a quietly confident manner that will intrigue you enough to progress to the next song. “It’s Not Love” then explores kookier territory. It is instantly more appealing than its predecessor, the use of a dismissive whistling effect and naturalistic instruments evoking a chilled and affectionate atmosphere. The lyrics are more of a focal point here, addressing and questioning life choices in a vaguely sneering, but somehow understanding manner. These quirks lend it a sense of breezy amiability, even though it’s not particularly warm. “Rainy Day” is the first track to leave a recognisable impression. Its brooding tones are rife with sentiment from the off, as the sullen vocals sing mournfully of disillusionment and hidden sadness. The music acts as a quietly cool accompaniment, intensifying the regretful tone in the lyrics and giving their wayward remorse a harsher edge. This song is a colder, more tangible offering that provides some much-needed foundation for the EP. Its fervour bolsters the record against the drifting, aimless air created by the prior two songs and adds more detail and sincerity. “Alone With You” counters this with a colourful, jubilant opening flourish that walks a fine line between engaging and distracting. There’s a curious sense of occasion evoked by the mismatching musical threads, though it’s not necessarily a good one. The vocals are delivered in a bemused manner and don’t do enough to balance the cacophonous instruments. It’s generally pleasant, but seems contrived. The band returns to form with “Where Do We Go,” a leering, ambient track that’s either cannon fodder for your inner daydreamer or overly indulgent, syrupy philosophising. It possesses all the wretched trademarks of really bad indie rock – an unwavering sense of self-importance, aimless drifting notes, and feigned depth but it is, somehow, effective. As a departure from the previous tracks, it works well, though it is mired somewhat by careering and sugary lyrics. “She Was the Only One” is a light-hearted ending, with clean keys and good bass work combining for something stylish and strong. The music matches the vocals for feeling and the album peters out on a summery wave of contentment. The Carry-On EP is more or less what that title would imply – something light and undemanding that provides a useful time-out from more serious music. It has its good points though as a whole, it’s quite staid and unremarkable. Consider it as frivolous, easy listening, but you won’t be missing much if you overlook it.